I'm pinching myself this morning. First on the bill last night was seeing my favorite young star Kate Baldwin at my favorite venue Feinstein's with some of my favorite people. 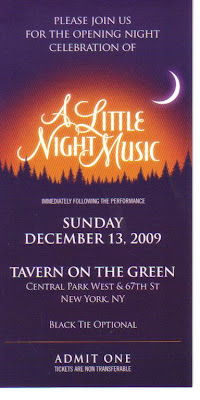 THEN I went to the Opening Night Party for A Little Night Music at Tavern on the Green, courtesy of an invitation from my delightful new friend Alan, who is involved as an investor with the show. He's a Broadway lover going all the way back to seeing the a replacement cast of the first run of South Pacific as a four year old. Decked out in my sparkly party dress, I arrived at the front door where I had to show proof of my ticket several times. Then I floated into an odyssey of a party. If you've been to Tavern on the Green, you know it's HUGE and this crowd took advantage. There were many rooms full of elegant party goers. There was a buffet dinner and many open bars. I had a piece of delicious white cake. I started out with a glass of red wine, but it was so crowded, I ditched it for clear liquid - water - as I wouldn't dare be responsible for sloshing red wine on some fancy party-goer. The stars were in the main room and fortunately, we were free to roam about after dinner. 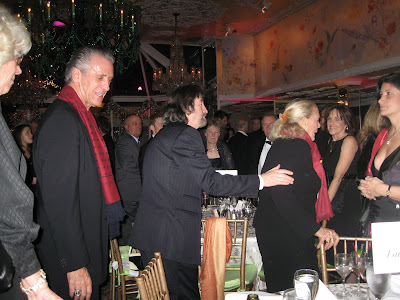 Before I even saw members of the cast, I saw Michael Douglas, Kathleen Turner, Pat Riley (yes, the basketball coach! ), Lauren Bacall, Wallace and Simpson, Judy Kuhn, and lots of Broadway producers and industry types. I patiently waited in a very crowded line to congratulate Angela Lansbury. Of course, she was as gracious as always and looked gorgeous (84? I think there's a painting in an attic somewhere...). While I was waiting, I was happy to greet Aaron Lazar, who plays the Dragoon. I love his performance - he's always solid in everything. Then after greeting Angela, in came Catherine Zeta-Jones. The room erupted in applause and a 1,000 flashes when off. 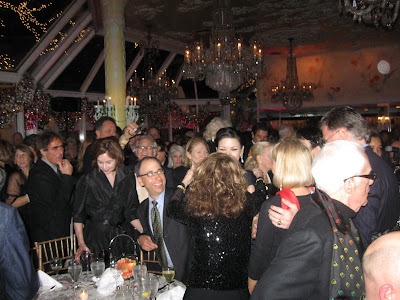 I never saw so many people congregate at once - she was a like a magnet and the room seemed to whoosh to her. 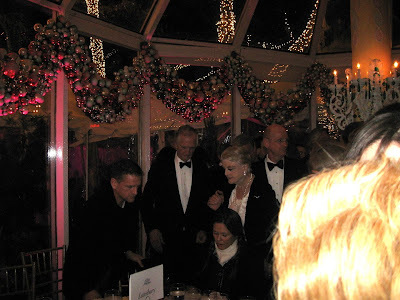 She finally made her way over to Michael Douglas, who was waiting for her with a very large bouquet of white roses. It was fun seeing them kiss and looking so happy to see each other. He seemed to be beaming with pride. Since I was sort of swept in to the crowd and unable to move, I got pretty close. She is unbelievable to look at - you daren't look to long, for fear of ruining your eyesight. The place became almost like a mosh pit and finally was able to escape to go in search of my friend Hunter Ryan Herlicka, who plays Henrick. I saw the very handsome Alexander Hanson, who plays Fredrik, but I never did run into any of the rest of the cast. Finally, I got a text message from my friend Alan that Hunter was spotted. I got a huge hug from him. I'm so happy for him! Around 12:30 am, my carriage was threatening to turn into a pumpkin so I joined the long taxi line. Even though I live only less than a mile from the Tavern, my party feet couldn't wait a minute more. 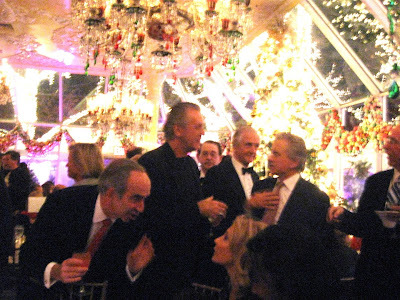 Inside, the party was still very full at that point and no doubt celebrated until the wee hours. And that's another opening night for me. Wow! I'm jealous. Great recap of the night. 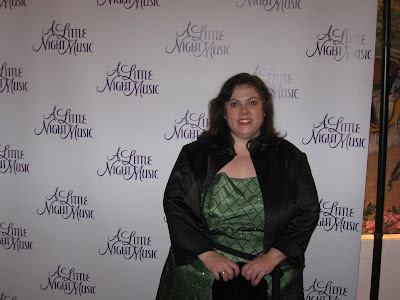 Me, all are very different and very wonderful - discounts are available on broadwaybox for Ragtime and Finian's but not yet for Night Music - it's possible there will be now though - and it's also has been a bit difficult to get a decent ticket for Night Music. Good luck and have fun! Applause to you & your party feet & a wonderful evening all around. What a lovely fairytale.